The undertaker Fred (Robert Donovan) is bankrupted and misses his former wife Helen (Belinda Bonini). She has left him and is going to marry Captain Winston (Jeff Fahey), whose daughter Rhonda (Tiffany Shepis) is the girlfriend of Fred's assistant Jerry Gordon (Stephen Williams). Fred has accidentally developed an embalming formula that brings the dead back to life and he is able to control the zombies because they need a dose every hour to stay alive, otherwise they die. When Fred receives an eviction letter from the bank that intends to build a mall in the location of his funeral home with the agreement of Helen, he decides to use his zombies to steal money, pay the bank, achieve power and get Helen back. However, when Jerry accidentally drops the fluid of his formula, he loses the control of the situation in his mortuary and the dead seek revenge against him. 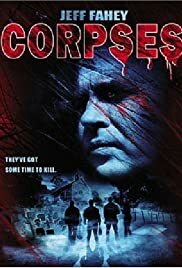 "Corpses" is a cult-movie absolutely underrated in IMDb. The gore comedy follows the style of Peter Jackson's "Braindead", with lots of black humor and blood. There are excellent lines along the story, and I loved the character of Rhonda Winston, responsible for some of the most hilarious moments, like for example, when she says to Helen that thinking does not suit with her obnoxious stepmother. This B-movie is a great entertainment and I really liked it a lot. My vote is seven.